TORONTO, Sep. 06 /CSRwire/ - The Return on Investment for Sustainability and CSR education is “priceless” according to Alumni of the University of St. Michael’s College Graduate Certificate in CSR & Sustainability. 1) Did graduating from the CSR Certificate program open new career opportunities for you? 2) Was your capstone project of value to your company? 3) After graduation, did you use the program's knowledge and skills to tackle a business challenge/opportunity for your company? 4) Did the Certificate in CSR help you to build a professional network of colleagues and subject matter experts? Also, participants reported that since their graduation they have advanced to some of the following positions: Executive VP & Chief Sustainability Officer, VP Stakeholder Relations, National Director Corporate Sustainability & Energy Management, Director Corporate Development, and Managing Director. The Certificate in CSR/Sustainability is taking applications now for 2016/2017. Module 1 will be held in Toronto, Canada, October 19-21, 2016. Module 2 and 3 will be held May, 2017 and November, 2017 respectively. To apply, go to the Certificate in Corporate Social Responsibility/Sustainability Website. See the program schedule, past graduates and news about the program. Next Generation Practices in the program include Transformational Company research, the Embedding Project and Change Management Simulations applied to CSR/Sustainability implementation. Another recent addition is the creation of learning and practice modules for the International Society of Sustainability Professionals ISSP-SA and ISSP-CSP Certification exams. The University of St. Michael’s College was one of the first post-secondary institutions to support the ISSP’s Certification process. Applications for the program are currently being accepted through September 30th. To apply, please go to the Certificate in Corporate Social Responsibility/Sustainability Website. Application Deadline is September 30, 2016. The Graduate Certificate in CSR & Sustainability is guided by an Advisory Committee made up of CSR/Sustainability Leaders from a broad range of industries from insurance to mining, including: Co-operators, Farm Credit Canada, Atlantic Lottery, Ricoh Canada, Scotia Bank (ret. ), Canadian Business for Social Responsibility,Centerra Gold, Enbridge, Conference Board of Canada, Rotman School of Management (University of Toronto). 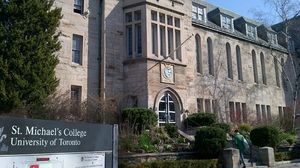 The University of St. Michael’s College (USMC), federated with the University of Toronto, is a Catholic institution of higher learning founded by the Congregation of St. Basil, whose motto, “Teach me goodness, discipline and knowledge,” sets the tone for campus life. Committed to the pursuit of knowledge, meaning and truth, USMC is a dynamic centre where the Catholic intellectual tradition thrives in a context of academic freedom and rigorous debate. As such, it seeks to provide an environment that fosters the intellectual, moral and spiritual development of its members. Rooted in a tradition of commitment to personal and social justice, the Certificate Program in Corporate Social Responsibility has been offered at the University for over 15 years.